One of the year's best meteor showers peaks tonight — and this year's outburst is expected to be the best since 2009. Here are some tips for how to catch the show. One of the year's best meteor showers peaks tonight — and this year's spectacle should be the best since 2009. Astronomers have predicted an "outburst" of the annual August Perseid meteor shower this year, which means that you could see double the usual number of meteors, up to 200 per hour, or three a minute, NASA says. The best viewing times are between 3 a.m. and dawn local time. The moon will set around midnight, providing darker skies that will allow you to spot dimmer meteors, which translates into a lot more of them. At that point, the constellation Perseus in the northeast — where the meteors will appear to originate — will be higher in the sky, providing a larger viewing area. Find somewhere dark with a view of as much of the sky as possible. As mentioned, waiting until the moon sets will help. Ideally, you'll want to lie down in an open area such as a park or field, as the meteors will streak across the entire sky and you don't want your view blocked by trees or buildings. Ken Tapping, an astronomer with the Dominion Radio Astrophysical Observatory in Penticton, B.C., says a view of the northeast sky and the constellation Perseus can also help you "get a better context." If you want some company, see if you can find viewing parties in your area. For example, the Dominion Radio Astrophysical Observatory is hosting one starting at 7:30 p.m. (starting with some lectures before dark). Look early and look often. Give your eyes time to adjust to the dark. NASA recommends starting about 45 minutes early. While the best viewing is in the dark hours before dawn, the Perseids produce lots of "fireballs" or bright meteors that are visible even when it isn't totally dark. 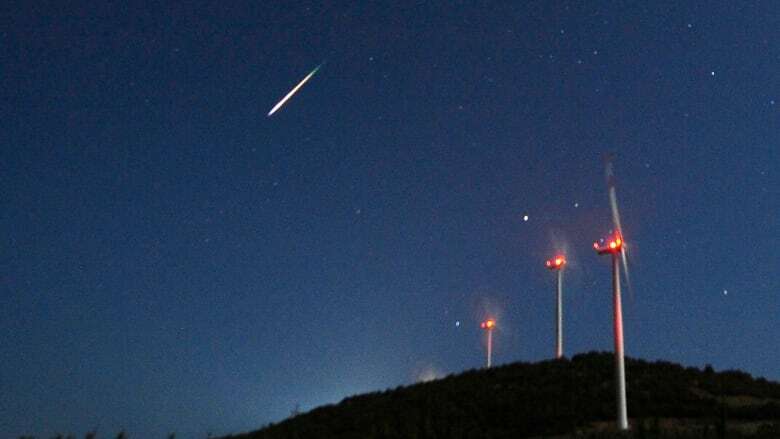 Peter Brown, a professor with the Meteor Physics Group at Western University in London, Ont., says that around 10 p.m., shortly after sunset, brighter meteors will be visible as spectacular "grazing" meteors that travel across much of the sky and can last for many seconds. If it's cloudy tonight, that doesn't mean you missed your chance. While the official peak of the meteor shower is the night of Aug. 11-12, there should still be lots of extra meteors streaking across the sky tomorrow night. In fact, some national parks such as Cape Breton Highlands National Park and Point Pelee National Park are holding their official meteor shower watching parties on Aug. 12-13. So is Gordon's Park Dark Sky Preserve on Manitoulin Island, Ont. People have already been seeing and photographing Perseid meteors for more than a week. If you find you really can't see any meteors because of city light or bad weather, Tapping recommends listening for them — tune an FM radio for a gap between two stations and listen to the static. "What happens is signals from distant FM stations, not normally receivable, bounce off meteor trails," he said. "Occasionally you hear a strong burst of music or speech." The Perseid meteor shower happens each year when Earth passes through the dust and debris left behind by the comet Swift-Tuttle centuries ago during its orbit around the sun. As those particles hit the Earth's atmosphere and burn up, they leave bright trails that we see as meteors. Normally, the Earth only catches the edge of Swift-Tuttle's trail, but about once a decade, Jupiter's and Saturn's gravity gives the trails a tug so that Earth ends up passing through areas where the dust trail is thicker. That can cause an "outburst" with more than the usual number of meteors. "We may go through a particularly dense part of the cloud this year," says Tapping. The 2009 outburst was similar to this year's prediction, with about double the usual meteor activity. Perseid outbursts in 1992, 1993 and 1994 were even better, with up to five or six times the usual number of visible meteors. "Sometimes what happens is people predict a bust and it's fantastic," Tapping said. "Or people predict it's going to be fantastic and it's a bust. The only way to really check it out is to go there and look."